Justin Bieber is one of the hottest teen stars of his generation. He’s the guy that the kids are going crazy for these days, picking up a pop-star torch once carried by New Kids on the Block and Duran Duran. 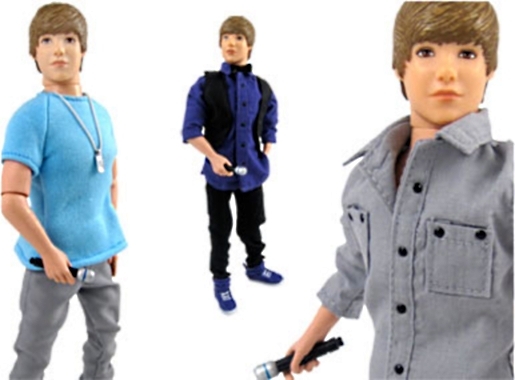 Now, like other teen idols, Justin Bieber is about to hit toy shelves with not one, but two collections of Bieber dolls. Start your Christmas shopping now, parents of preteen girls. The Bieber dolls won’t reenact some of Bieber’s most noteworthy moments, like walking into a glass door or being brained with a water bottle, but they will reenact his signature looks and his music video outfits. One collection, the Music Video Collection, features a mini-Bieber dressed in outfits from his “One Time” and “Baby” videos, while The JB Style Collection features Bieber in various outfits, from street style to red carpet and awards styles. The Music Video dolls will retail for $27.99, while the JG Style dolls will retail for $17.99. There are also tee-shirts, toy microphones, and other goodies available from Justin Bieber Toys. You can preorder now, if you’re so inclined. Just make sure it’s the right Justin Bieber, not the other Justin Bieber.